Why do cops’ traffic stops tie up the busy Post Road? What goes on in a domestic violence call? And what’s it like to ride with a police officer on a shift? Those questions — and many more they didn’t even know to ask — were answered clearly and honestly for 25 Westporters recently. 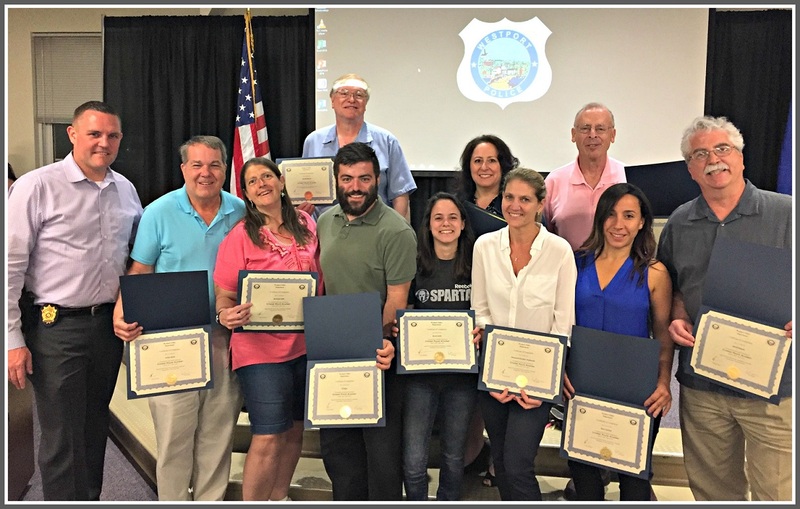 They were members of the Citizen Police Academy, an innovative program that brings community members and cops together for 9 weeks of intense, interactive sessions. The goal is to bridge the gap between the Westport Police Department, and the citizens they protect and serve. With many officers not living in town — and many residents having little interaction with police — there are too many chances for misconceptions and myths. The first Citizens Police Academy was held in 2009. The next one was 7 years later. There was not enough interest last year. But this time — thanks to great publicity by the Sunrise Rotary Club, on Facebook and through work of mouth — organizers turned people away. A similar youth academy — for high school students — ran concurrently. Lieutenant Eric Woods — who runs the detective bureau — led this year’s sessions. Lieutenant Eric Woods introduces the class to police techniques. The adult course began with an overview of the organizational structure of the WPD, and a tour of facilities. Quickly, the class jumped into meaty topics. They included domestic violence, the Youth Bureau, patrol techniques, criminal investigations, crime scene processing, DUI enforcement, dispatch, presentations by the state attorney and public defender offices, recruitment, training, interactions with other police departments and the Westport schools, K-9, SWAT, and the marine division and dive team. Participants rode with patrol officers, got certified in CPR, and experienced the pistol range with a police-issued firearm. David Kinyon prepares for his ride-along with Officer Shane Pucci. Rick Jaffe was one of the citizen participants. He raved abut the course. “The police department is one of the most important and sensitive components of life in Westport,” he says. “When we pull someone over, we want them to go to a parking lot,” Woods explains. Members of the Citizen Police Academy — some of whom are shown here at graduation, with Lieutenant Eric Woods (far left) — learned quite plenty about police procedures and techniiques. Once Academy students hear those explanations — and others like it — they understand, Woods says. Woods cites the ride-alongs, firing range, K-9 unit, and dialogue with the state attorney and public defender as high on the list of topics the Westporters learned from and appreciated. Course members ranged in age from 20s to 70s. They included attorneys, corporate executives, and a retired firefighter. 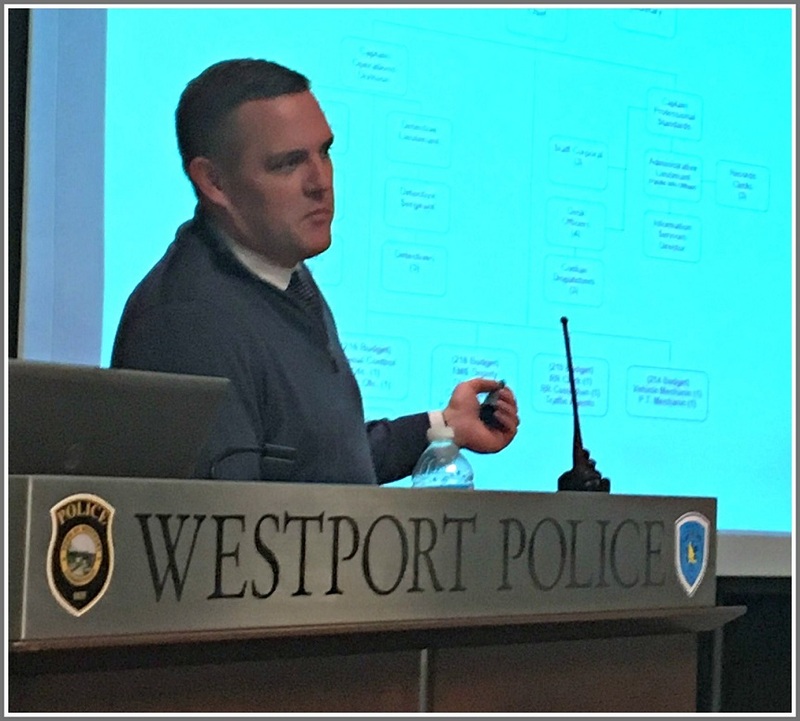 The Westport Police Department covered all costs (primarily for instructors’ time). They plan to run both the adult and youth courses next year. Once again, they’ll probably turn people away. Whoever thought Westporters would clamor to get into the police station? 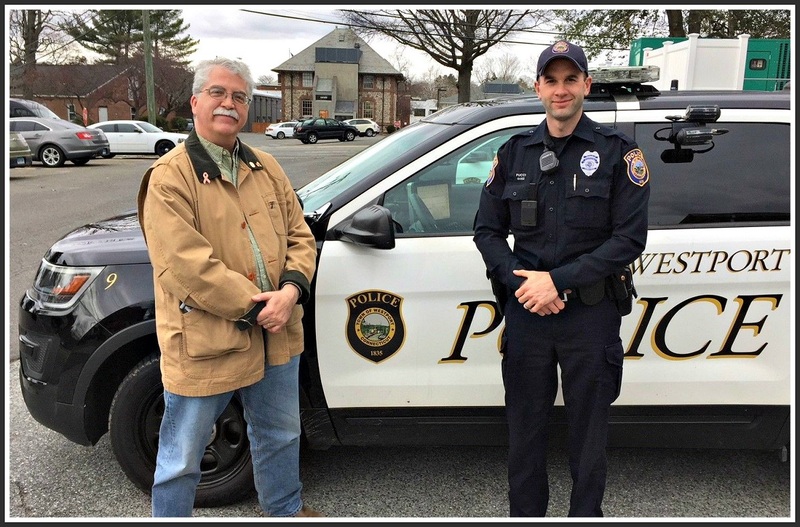 This entry was posted in People, Police and tagged Lt. Eric Woods, Rick Jaffe, Westport Citizen Police Academy. Bookmark the permalink. Citizens Police Academy IS a hidden gem! It is a class everyone should take! Bridging a gap by education, understanding, dialog and camaraderie between fellow civilians and the officers who we are so very fortunate to have serving us. There is a lot going on at the Westport PD! A lot of intensive and on-going training, a lot of responsibility for this community and her citizens and a lot of passion for the profession and for keeping Westport safe. A big THANK YOU to everyone at the Westport PD! Grateful to have such a talented and dedicated team of Officers!! Sign me up again!! I took the class a few sessions back, could not recommend it any higher for all Westport residents but even more for our kids, especially high school-age. My son attended the youth version and not only enjoyed it but took away a ton a great information about a host of issues he faces every day in Staples. He also formed good relationships with the Westport youth officers and went on to join the Westport Police Youth Group…still attends their meetings. I strongly suggest getting your kids involved. I’m sure the PD will add a session introducing the new School Resource Officer position to the kids as well. Shout out to Chief Koskinos, Lt. Jillian Cabana, Youth officers Ned Batlin and Sereniti Dobson…..keep up the great work! This was one of those wonderful experiences that the 25 of us will remember the rest of our lives.. Highly recommend it for all residents so that they can see what the Westport Police actually go through on a daily basis. We met highly trained and top-notch detectives, captains and officers. They are required to receive a certain amount of training every 3 years as per CT state guidelines, and most–if not all–of our officers take more classes that far exceed the state minimum. Suffice to say, it’s great to know that we have the fine men and women of the Westport PD keeping us safe 24/7. A special thank you to Lt. Eric Woods, our fearless leader for the past 9 weeks! I echo the high praise to Lt. Eric Woods, and the entire Westport PD for their generosity of time, information, and inviting us to “walk in their shoes” during our 9-week course. Every class was insightful, open to a diversity of questions and perspectives, and truly educational. Field training like the weapons handling and ride along enabled participants to practically apply concepts and to observe the PD do what they do best. Big shout out to Patrolman Dan Paz for his patience with my tons of ride along questions! I encourage Westporters to participate in the WCPA! Thank you!